She Writes Press, 9781631528200, 372pp. In the 1960s and '70s, thousands of baby boomers strapped packs to their backs and flocked to Europe, wandering the continent on missions of self-discovery. Many of these boomers still dream of "going back"--of once again cutting themselves free and revisiting the places they encountered in their youth, recapturing what was, and creating fresh memories along the way. Marianne Bohr and her husband, Joe, did just that. In Gap Year Girl, Bohr describes what it's like to kiss your job good-bye, sell your worldly possessions, pack your bags, and take off on a quest for adventure. Page by page, she engagingly recounts the experiences, epiphanies, highs, lows, struggles, surprises, and lessons learned as she and Joe journey as independent travelers on a budget--through medieval villages and bustling European cities, unimaginable culinary pleasures, and the entertaining (and sometimes infuriating) characters encountered along the way. 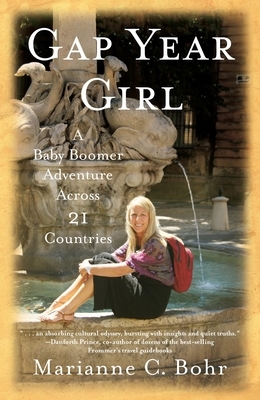 Touching on universal themes of escape, adventure, freedom, discovery, and life reimagined, Gap Year Girl is an exciting account of a couple's experiences on an unconventional, past the-blush-of-youth journey.